The clever people at Barnaby’s Bistro in Padstow have revamped their menu, which now focusses on small plates, and larger plates to share, similar to their sister restaurant Prawn on the Lawn. 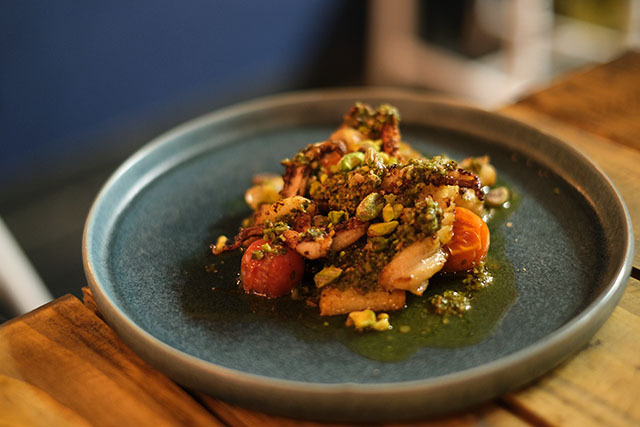 With food cooked in and on the wood fired oven, Barnaby’s uses ingredients as local to Padstow as possible, and dishes have a strong middle eastern influence. Just reading the menu will cause tummies to rumble; flavour combinations are bold and innovative. For those who don’t know their za’atar from their zhoug, there’s a handy glossary on the back of the menu, explaining the more unusual spices and ingredients. It’s worth noting that there is a good choices of dishes for vegetarians too. Barnaby’s is a small and cosy restaurant on Duke Street. 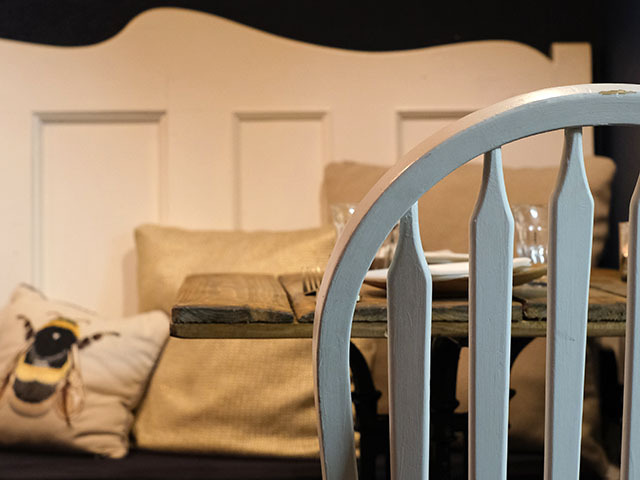 Equally suited to a romantic evening for two, as a fun night out with a bunch of friends, the atmosphere is warm and relaxed, and the staff are super-helpful. 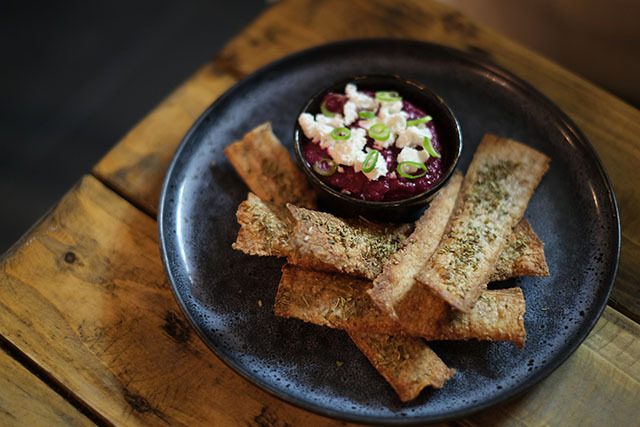 First to arrive was the sweet and earthy beetroot dip, which was topped with feta and spring onions, and served with paper-thin za’atar topped crisp breads. We could have eaten a bucket of the mojo rojo chicken croquettes. 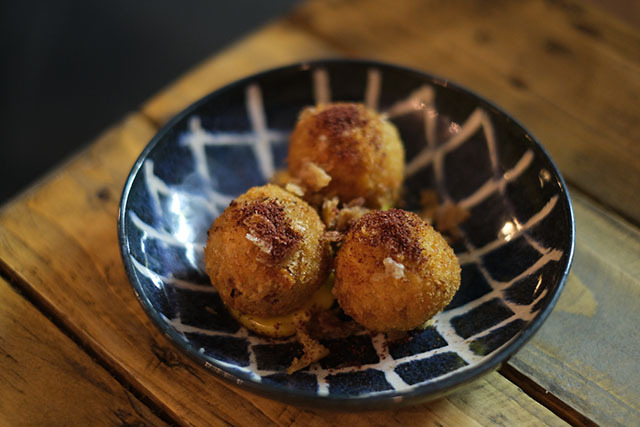 So savoury and moreish, the succulent chicken inside the croquettes contrasted with the crunchy breadcrumb coating and little pieces of crispy chicken skin. They sat upon a spoonful of delicious roast chicken mayo. Jim had to order the Big Jim chillies, for their name alone. 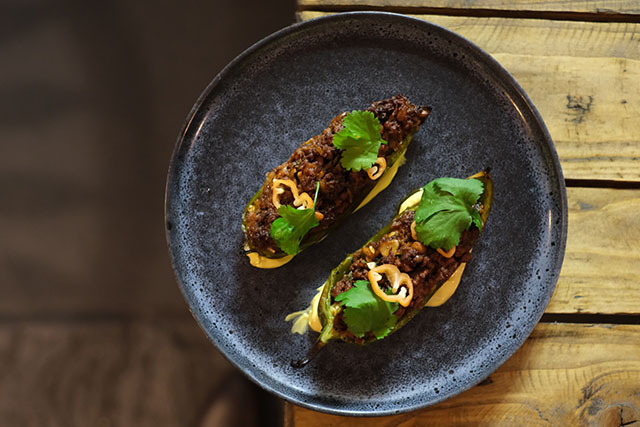 These large smoky-flavoured chillies were stuffed with gently spiced lamb mince and served with saffron yogurt. I love kalettes, and these were grown just up the road at Padstow Kitchen Garden. 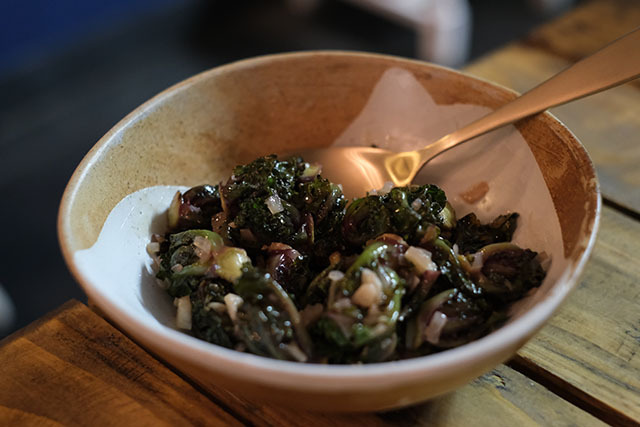 In this dish, the kalettes were cooked with garlic and shallots, and dressed with agridulce, a bittersweet vinegar, which added so much depth to the flavour. The next dish reminded us of holidays in San Sebastian. Succulent king oyster mushroom were drizzled with truffle oil and covered with a heap of shoestring fries. On top sat a confit egg yolk which, once popped, provided a rich sauce to dip the chips into. The squid was packed with flavour. Chargrilled to perfection, and crispy yet juicy, it was mixed with roasted tomatoes, pistachios and zhoug, a chilli sauce from Yemen, made with coriander, garlic, green chilli and cardamom seeds. 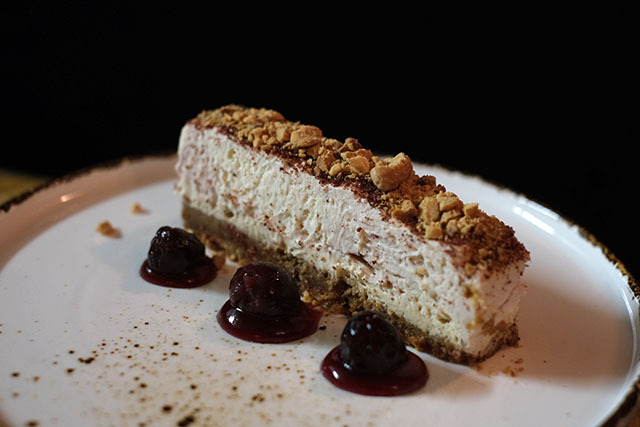 This cherry cheesecake was exceptionally good. The flavours were enhanced by the gentle warmth of sumac, and the crunch of toasted almonds made for the perfect mouthful. Last but not least, was this delicious chocolate and walnut tart. 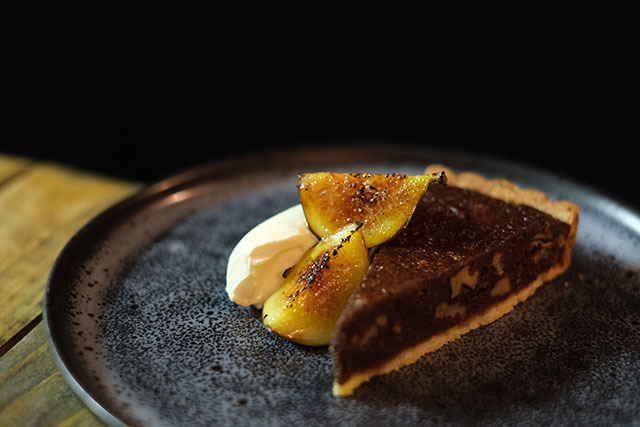 Not too dark, yet not too sweet, this rich dessert was lightened by the addition of roasted figs and dollop of crème fraîche. 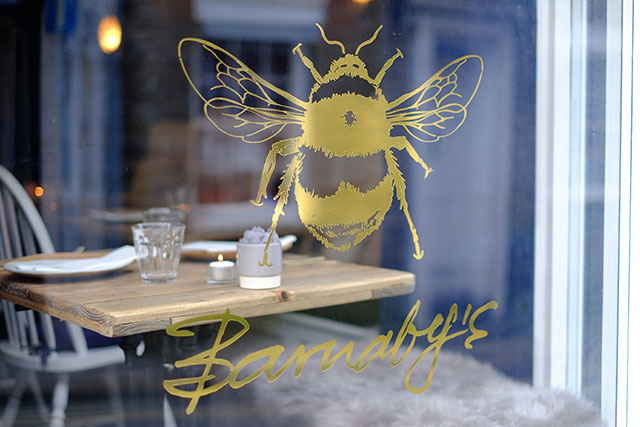 We enjoyed each and every dish; everything we tried was well-flavoured and well-cooked, and it was clear that only top-notch ingredients are used at Barnaby’s. Service was impeccable; the restaurant is comfortable. Dishes range in price, with starters priced between £4 and £6, sides at £4, small plates between £8.50 and £12.50, and desserts £3.50 to £9.50. 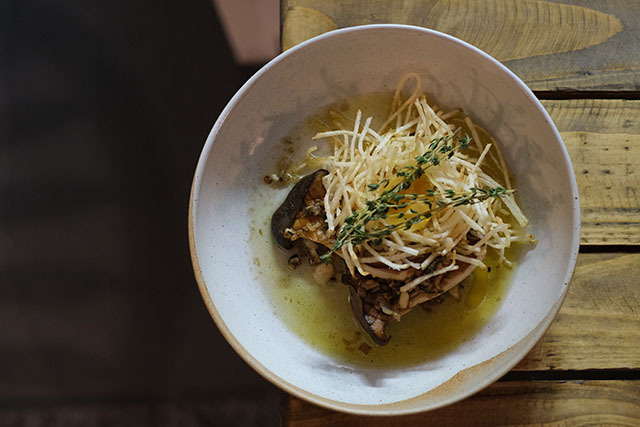 Larger sharing plates vary; for example the whole plaice with chicken stock and leeks (2-3 people) is £32, T-bone steak with mojo rojo and mojo verde (2 people) is £50, and the whole seabass with smoked harissa butter (for 4) is £70. To see the full menu, or to book a table, please visit barnabyspadstow.com. Barnaby’s Bistro, 22A Duke Street, Padstow, Cornwall, PL28 8AB. Disclaimer: We were guests of Barnaby’s. Thank you to Rick and Katie Toogood for treating us to supper, and to Harriet, Craig and team for looking after us so well on the night. All photos copyright Jim Michell, Barefoot Media. Want to read more? Check out our guide to the Best Restaurants in Padstow.